stuart wrote in Sun Nov 18, 2018 10:08 pm: adam_one: I think you're just hitting the limitations of loading time for the large model files that osm2city is generating, unfortunately. There's also an interaction with OSG's PagedLOD which can result in models being unloaded earlier than you might want. The very first proof of concept is very promising. I have just run a first iteration over Edinburgh, which has about 72k buildings in tile 2892923. Writing all buildings either attached to another, having parent/child relations or being larger than 200 m2 the usual way and the rest with the new BUILDING_LIST STG-verb, results in ca. 25 MB disk used for meshes for ca. 13k buildings and 1.1 MB disk used for the test ca. 60k buildings in random buildings. Not only is this a order of magnitude improvement in disk space, but my little old development notebook happily loads both - and the random buildings are loaded fast. Btw: the idea is that certain buildings in OSM (based on size and tags and geometry and ...) will continue to be generated in meshes, but the number might decrease over time. Unrelated to @legoboyvdlp's question, regarding manufacturing buildings in an area that doesn't yet have any real buildings placed in OSM, I was wondering if you plan to provide any kind of check whereas if an actual building has been input in OSM it will override any random generated pseudo buildings. What I am concerned with is, I like the idea of populating areas where OSM simply never had anybody input buildings yet but the track or street data is there so you can reasonably extrapolate and produce data for the area. But one thing that makes OSM so special is the realistic nature of the scenery where the data "has" been input into OSM. I hope that if an area is populated in OSM it would have priority over random generated pseudo buildings. Is that to be the case or are you diverging from using actual OSM data and opting more for data generated based on likely candidate based extrapolation logic? What I am trying to say is I hope there will always remain an option in FG or osm2city, depending on where this eventually goes, to generate only the realistic "actual" data if one chooses, even if that means holes in the data due to lack of data. Maybe with the ideal situation being a combination of both, again as an option, where manufactured data will be generated in lieu of actual data if it doesn't exist yet. wlbragg wrote in Sun Nov 25, 2018 10:56 am: Unrelated to @legoboyvdlp's question, regarding manufacturing buildings in an area that doesn't yet have any real buildings placed in OSM, I was wondering if you plan to provide any kind of check whereas if an actual building has been input in OSM it will override any random generated pseudo buildings. 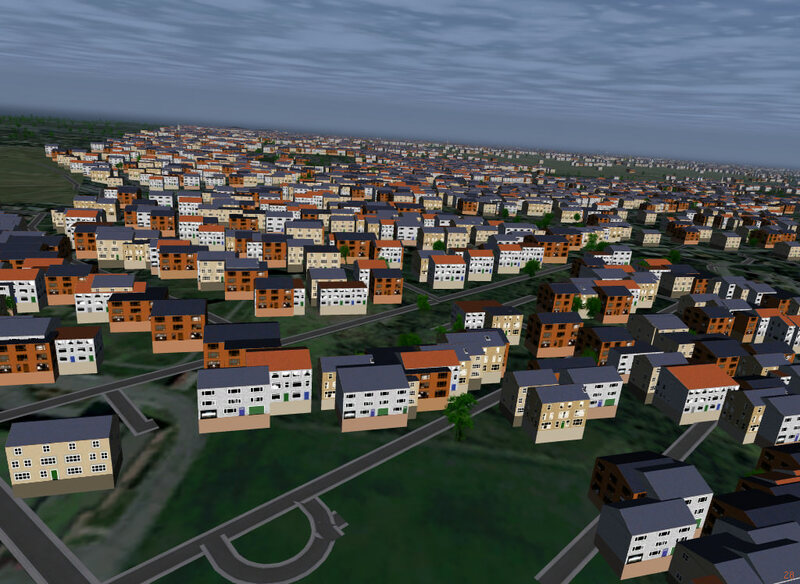 There is a parameter OWBB_GENERATE_BUILDINGS, which decides whether or not plausible buildings are created in areas, where there is no OSM data, but where there is land-use data either in OSM or in BTG-files. I.e. if you do not like these buildings and rather have holes, then just set the parameter to False. Once the buildings are created (no matter where they come from), they are treated the same way in later analysis. There is right now a parameter FLAG_STG_BUILDING_LIST which decides, whether "some" buildings (hopefully > 70%) are rendered in shaders using Random Buildings or not. Setting this to False gives the possibility to have all in meshes (I might rename it, when the feature is "stable"). Even though it is "Random Buildings", it is not that random: the placement, size and nature (as far as Random Buildings allows it now or later) of the building will be based on an actual or plausible building. So it is a replacement. Remember that for most buildings even from OSM the available data in tags is quite limited. So even though using simplified buildings in Random Buildings might hide some of the complexity of floor plans, all the rest is just interpretation based on heuristics. Right now the textures used in Random Buildings are much better than the ones on osm2city-data. That will hopefully change some day, but I do not see a good way to regionalise osm2city-data. Also: IMO most regionalisation is relevant for detached buildings and row-houses. Large buildings etc. look "the same" all over - and make sense to include in meshes instead of Random Buildings. So I believe that there will be enough parameters to generate just the scenery one wants. However the sceneries to be included in Terrasync need to be a bit optimised for both disk space and rendering performance - so I guess Random Buildings will be used somewhat aggressively. Not sure whether I answered your questions, are there other concerns? Yes it did and I like your approach, even the idea of shader based buildings that are loosely based on their detailed OSM counterpart. 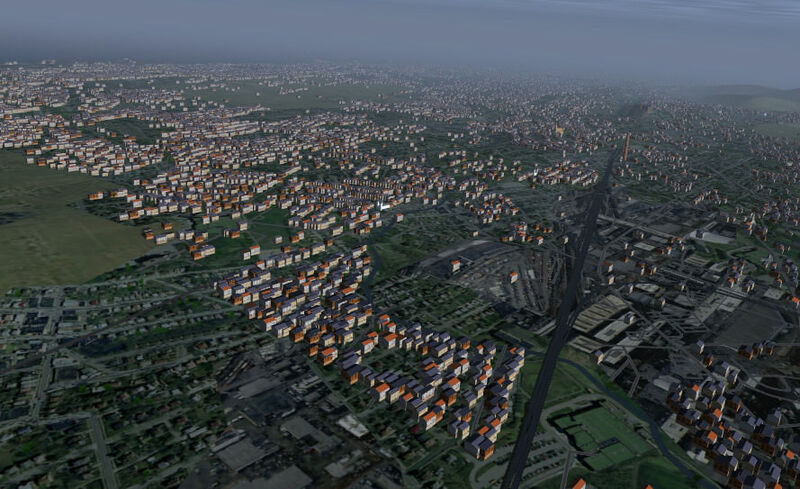 Having the option to "opt out" and use only "absolute" data satisfies my concerns for absolute realistic OSM scenery. The other thought was that should this ever be a built-in with the FG source application that we include the same customizations and opt-in/outs. Cars seem to be driving in opposite directions here? I wonder is it possible to force cars to drive on the left if the two carriageways are marked as a single road in osm? Actually the piece of road you show in the picture appears to be mistakenly on top of another road (?) - to the right there's proper two lane traffic into the same direction, which I suspect might also be underneath the left. Or an interchange where the top road is an offramp to change highways and supposed to be at a different elevation. 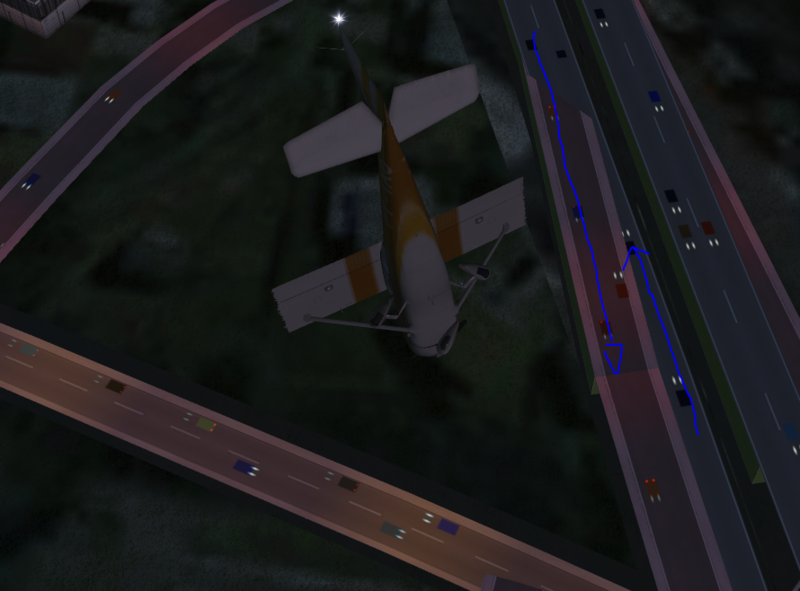 The output file in my params.ini file is defined as PATH_TO_OUTPUT="C:\\Users\\daniel\\flightgear\\customscenery\\kchs". In the output directory the C:\\Users\\daniel\\flightgear\\customscenery\\kchs\\Buildings\\w090n30\\w081n32 path is created, but nothing is populated in the directories. Note: this is a win 10 environment with an anaconda python env setup for python 3.5, and postgresql 9.6. I am on mobile so I may be incorrect as to how I fixed it, but this is almost certainly how. I will check in the morning. I've found that the file path wasn't being computed correctly - or maybe it's an issue related to my file structure? When I tried fixing it in the separate files I got wierd results due to conflicts. I would suggest trying my fix above first to see if it works? This doesn't seem to be related to the problem that I'm seeing. I don't have slashes in my prefix, so this is a NOP either way.